Willingsford holds international certifications to ISO 13485:2016 standards for the design, development and manufacture of wound care products. 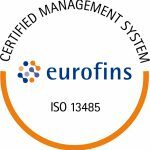 All our standards and processes are regularly externally audited and inspected (announced and unannounced) by the independent and impartial organisation, Eurofins, who is accredited by the European Commission as a Notified Body and whose certification and inspection services are furthermore accredited by FINAS, the Finnish Accreditation Service. ISO 13485 is quality management certification specifically in relation to medical devices for humans. Our internal analytical methods and tests are in accordance with the standards and guidelines of The International Council for Harmonisation of Technical Requirements for Pharmaceuticals for Human Use, ICH. Manufacturing and Packaging is performed in Class V clean and environment controlled conditions.